MLB teams are developing young players better than ever. We’re seeing kids come up from the minors and have an immediate impact much more often than in the past. Consider that, in the 2010s, there have been 188 rookies who put up a +2 WAR season. There’s still one year to go in the 2010s too. Only 174 did it in the 2000s and only 145 did it in the 1990s. Teams are quite good at player development. That includes the Yankees, of course. 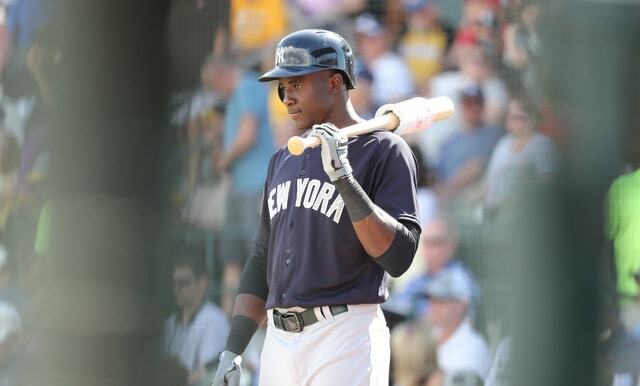 Within the last few years their farm system has produced Aaron Judge, Gary Sanchez, Luis Severino, Gleyber Torres, Miguel Andujar and others. That’s the foundation of a 100-win ballclub right there. The farm system isn’t as strong as it was two years ago, but that’s okay. Just about all the top prospects are now productive big leaguers. Others were used in trades for MLB help. That’s what a farm system’s for. There’s Acuna in his own little tier, Florial in his own little tier, then everyone else. Statistically, Florial had a crazy impressive 2017 season. His 2018 season did not go as well. He authored a .255/.354/.361 (110 wRC+) batting line in 339 High-A plate appearances, which is quite good for a 20-year-old in a vacuum, but is below expectations given what Florial did a year ago. We were all expecting a little more. A fractured hamate bone and subsequent surgery split Florial’s season into two. He missed close to two months and his High-A numbers before the injury (107 wRC+ in 156 plate appearances) were not significantly different than his High-A numbers after the injury (112 wRC+ in 183 plate appearances). Florial did absolutely annihilate rookie ball during his rehab assignment (330 wRC+ in nine games), which I guess is cool, but it is only nine games. Florial turned 21 in November and he’ll head into 2019 as both the top prospect in the farm system and also a player looking to rebound from a difficult season. It’s tough to know how much the wrist injury impacted his performance. Chances are he played through some discomfort before finally having the surgery, and wrist surgery is notorious for sapping a player’s power even after he’s deemed healthy and ready for game action.
? Florial lacks two things right now. One is good health. He’ll be nine months out from wrist surgery when Spring Training opens next month and hopefully that means he’ll be fully recovered. Wrist trouble can linger a bit, even through an offseason of rest. If it does, there’s not much the Yankees and Florial can do other than wait until the strength in the wrist is all the way back. The second is pitch recognition. Florial has walked a good deal in his career to date (11.1% walk rate), but minor league walk rates are notoriously fickle, and that is especially true the further away you get from the big leagues. There are a lot of pitchers in rookie ball and Single-A ball who are chucking the ball from the mound and hoping it’s over the plate. A good deal of them can’t throw three strikes before they throw four balls. Pitch recognition is the great separator. Hitters who can discern pitches thrive and those who can’t often struggle. A lack of pitch recognition is not a total dealbreaker — guys like Jeff Francoeur and Jose Guillen had long MLB careers despite seemingly having no idea what pitchers were trying to do to them — but it is a significant obstacle. A lack of pitch recognition has prevented countless talented players from reaching their ceiling. Although the overall numbers were underwhelming, it is encouraging Florial cut his strikeout rate (27.6% to 25.7%) and swing-and-miss rate (16.8% to 13.1%) as he jumped from Low-A to High-A this past season. It suggests (but does not confirm) pitch recognition improvement. It’s one of those things that is difficult to see statistically, if it is possible at all. You need to watch at-bats and read swings to evaluate pitch recognition. Florial is a four-tool player and the one tool he’s missing is consistent contact ability. Plate discipline and pitch recognition are a part of that. Generally speaking, Florial can tell a ball from a strike. His issues are with telling a fastball from a breaking ball, things like that. That “four-tool player and the one he’s missing is contact” profile is dangerous. It’s more likely to produce Drew Stubbs than Christian Yelich, you know? No prospect is truly a can’t miss, but Florial is less of a can’t miss than Torres or Judge or Sanchez, if that makes sense. He’s loaded with natural ability and that’s great. Give me tools and athleticism. He also has some very real flaws to correct, specifically with his pitch recognition, and that’ll determine whether he develops into a legitimate core piece or just an okay complementary player. At 21, he has time to improve all aspects of his game, and this season I hope to see more contact and more overall refinement in Florial’s game.